Here are some of the most common questions that we are asked; We hope that you find the answers helpful. ♥ How soon can my order be shipped? ♥ Can I place an order by phone? ♥ Do you have a catalogue? ♥ What do you do with my personal information? ♥ How do I pay for my order? ♥ What if I am not pleased with my order? ♥ How much is postage? ♥ Is there a minimum order? 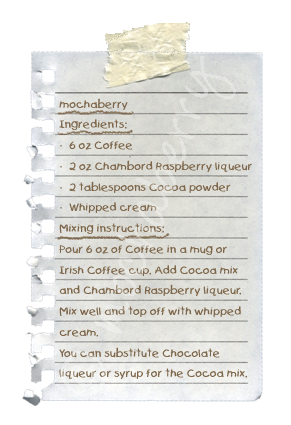 ♥ Where does the name 'mochaberry' come from? Your order will be despatched within 3-5 working days ( however personalised items can take up to 10 days ), depending on what time your order was placed, and on our current work load at the time. When you place your order an e-mail confirmation will be sent to you. We will contact you by e-mail if any problems arise. No. We're sorry but at present we are unable to take telephone orders and payments, although we are happy to answer any queries by phone or email. You can always visit one of our shops if you are in the area and talk to a member of staff. We do not have a catalogue as we are constantly adding new items to our shops, so a catalogue would soon go out of date. This website is kept up to date with a selection of our latest stock. Any data collected is used only to process your order. No information will be passed on to third parties. All payment details are made through PayPal secure servers. Payments can be made by credit or debit cards with PayPal. You do not need a PayPal account to make a payment. All payments are taken through their secure servers. What if I am not pleased with my order? We hope you love the items you have purchased from mochaberry, but if for any reason you wish to return them you can do so within 7 days of purchasing. You will need to return items in perfect condition, unused and in their original packaging. Simply return the item packaged securely with your name and purchase number inside please. Any costs incurred in returning an item is the responsibility of the customer. Damaged or faulty goods must be notified to mochaberry within three days of receipt of order. We've tried to keep the postage & packing rates as low as possible. We think that it is always helpful to know these before you get to the checkout and get an unwelcome surprise. Personalised cards which are large letter size incur a cost of £1.50 p&p. As a cost saving, if you are just ordering a couple of standard size greetings cards then you can order up to 2 cards for just a £1.00 p&p charge. All other orders will incur a £2.95 p&p charge. No, you can buy as little or as much as you like. Where does the name 'mochaberry' come from?